The team at STROPS have been hard at work for more than seven years designing and live testing the now well-proven STROPS AVS camera system. The whole concept came about when working as systems integrators at an internationally known development company. We identified early that there were vulnerabilities in existing surveillance solutions. 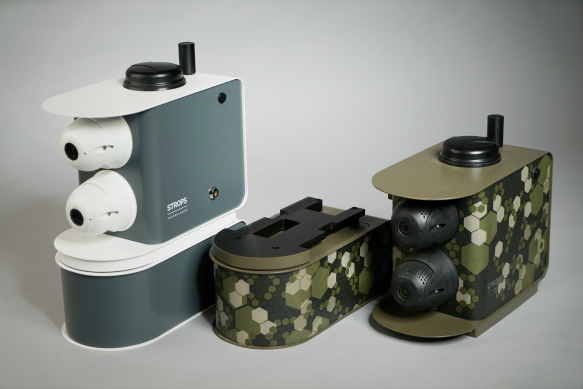 A key component was missing from the equation: a battery powered, high precision, easily sited and re-sited video camera that could be seamlessly integrated into a broad-based surveillance system. So we set about designing one, and establish STROPS Technologies to focus on R&D and the manufacturing of new-technology solutions for the security industry. Development and testing of our first product – STROPS AVS – took over two years, and in late 2015 we introduced the ground-breaking innovation to the market. Having met with enthusiastic applause from the industry, we are expanding our global partner network and will make the STROPS AVS – together with future technologically-advanced products – available to systems integrators around the world. If you have identified a need for our mobile battery operated video surveillance system in your country, please get in touch with us. We haven't convinced you yet? See what our clients and partners say about STROPS AVS. The strength of Visuatech lies in always providing the best and most efficient solutions to our customers. Since Strops AVS is high quality, low maintenance, easy to install, and completely autonomous, it’s the perfect solution for mobile security. Because of its compact size and low weight, you can deploy it very fast almost anywhere. There is no need to first set up an infrastructure or to hire transport, you can just move it by car and, once it's in place, just attach the Strops AVS to a pole. That’s all! ONE Telecom is a company that provides a full service to its customers so that they don't need to worry about anything. We chose STROPS AVS because their cameras can be used in severe weather conditions and can withstand snow, rain, sun, etc. Mobile solution that significantly helps municipalities perform their functions by sending in a live video feed from locations where trouble might occur but it's not possible to install conventional video surveillance systems.